A perfect treat for those hot summer days. The kids love it cause it’s like Christmas in June, July, or August. 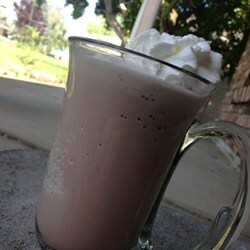 To make it look even more like hot chocolate, serve with whipped cream and chocolate shavings. Blend ice, milk, and hot chocolate mix together in a blender until smooth.